Are the performances really free to attend? Yes! We perform this inspiring music for free as a service to the community. We desire that everyone in the San Antonio community have the opportunity to listen to this inspiring and beautiful music about our Savior, Jesus Christ. The entire performance is approximately 1 hour and 30 minutes in length. Each performance begins with a brief opening act performed by a Youth Choir & Children's Choir performing three short Christmas pieces. Following, the San Antonio Messiah will present approximately 1 hour and 15 minutes of pieces from Handel's Messiah. There is a large parking lot onsite, however, sometimes the parking lot does reach capacity. If the parking lot is full, parking lot attendants will be on hand to direct cars to the nearby UTSA school parking lot on Valero Way, if the school is not using the parking lot on the same evening. 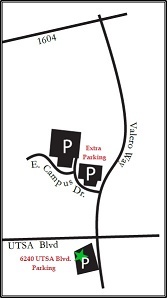 If the school parking lot is in use by the school, then cars may park along Valero Way at their own discretion. We encourage Sunday Dress or Business Casual, but no dress code is mandated. Since the performances are being held in a church, we do encourage modest attire. Children are allowed to attend. However, if your child is being noisy or a distraction, we would ask that you please take your child into the provided rooms at the back of the building so other audience members may still enjoy the performance. A Baby Room is available for babies & toddlers in the Relief Society Room and a Children's Room is available for older children in the Primary room. Both the "Baby" room and the "Children's" room will have audio and usually video available so you can still enjoy the performance while allowing your children to get out their wiggles and use their voices. These rooms are unsupervised, so please stay with your children at all times. These rooms do not contain toys, but are simply a large room for your children to move around in and use their voices while still allowing you to hear the performance. No. The entire performance is only an 1 hour and 30 minutes long which does not warrant an intermission. What is the seating like in this venue? The front chairs are padded. For those chairs not padded, we have a large number of seat cushions that will be placed on the remaining chairs. There will be seating for about a thousand guests at each performance. We do not anticipate running out of seating, although that's always a possibility. For those who sit in the back, you will also be able to see the choir and orchestra via the lowered projection screen in the back. Ushers should be stationed at the doors to allow late guests to enter between pieces. If an usher is not present, the music can be heard in the foyers, so please be respectful of the performers and other guests by only entering between pieces. Can I leave in the middle of the performance? If you need to leave to use the restroom or for some other reason, please be respectful of the performers and other guests by only leaving and re-entering between pieces. If you have a noisy child though, feel free to take them immediately to the Baby room or Children's room if you cannot wait until between pieces. How many musicians are in the Messiah Choir & Orchestra? The numbers vary from year to year, but we typically have between 175-240 singers in the choir and 55-70 musicians in the orchestra. Is this a community event or a church event? The San Antonio Messiah is a community event hosted by a church. We typically have volunteer musicians from about 30 different religions/denominations and about 70 different congregations. We are grateful to be able to come together as a community to celebrate the life of Jesus Christ through music. No, they are all volunteers who love performing beautiful music and/or worshipping Jesus Christ through music. Aren't they absolutely amazing for a group of volunteers?!!! Are the conductors and the Messiah Committee members paid? No, they are all volunteers who love Jesus Christ and good music and spend countless hours throughout the year to organize the Messiah Production so others may also feel the joy and spirit of Jesus Christ through the music of Handel's Messiah. They do an amazing job and we are blessed to have so many wonderful volunteers who have the same goal in mind of spreading the love of Jesus Christ and who love producing this inspiring and beautiful music. Why do you have more soloists than is traditional? While traditionally there are only four soloists, one soprano soloist will sing all of the soprano solos and so forth, we want to give as many people in San Antonio the opportunity to perform a solo as possible. So, we hold auditions each year and usually select between 9-11 soloists, depending on the length of the pieces being performed. Which pieces will be performed from the Messiah? Since we're performing the Messiah at Christmas time, we try to perform a good portion of the pieces about Jesus Christ's birth, sprinkled in with a handful of other pieces about the life, death, and resurrection of Jesus Christ. We typically select 8-9 choruses, 2 orchestral pieces, and between 8-10 solos depending on the length. The choruses we're performing this year are: And the Glory of the Lord, And He Shall Purify, For Unto Us a Child is Born, Glory to God, Surely He Hath Borne Our Griefs, And With His Stripes We are Healed, Let Us Break Their Bonds Asunder, Hallelujah, and Worthy is the Lamb. How do I find out more about the church that is hosting the event? The performances are sponsored by The San Antonio Texas West Stake, which is a congregation within The Church of Jesus Christ of Latter-day Saints. You can go to www.Mormon.org to learn more about the church. Books, cards, and pamphlets about the church are also available to take in the main foyers, and if you have any questions or want to know more about the church you can talk to the conductor or any other members from the church. I would love to perform with you! How do I join? If rehearsals are already well underway or over, we'd ask that you join the following year and enjoy attending one of our current performances. If you would like to be added to our rehearsal e-mail list, click the Contact tab at the top of this page and send us your information and which group you would like to perform with. There are no auditions for the Messiah choir and orchestra for ages 18+. Youth ages 16-17 may audition for the Messiah Choir and youth may audition for the Messiah orchestra but should have considerable experience. There are also no auditions for the Children's Choir, ages 8-11, or for the Youth Choir, ages 12-18. The soloists are selected by audition only. We try to have all performance dates, rehearsal dates, and solo audition information posted before the Summer, so please keep checking back for that information.